Why do traces to some sites always return 'Destination Address Unreachable'. I can connect to that site fine with Internet Explorer/Firefox/Chrome! One of the routers used between you and the destination site is not passing through ICMP echo requests, or one of the routers is not allowing ICMP TTL Expired packets to return. Some sites, for security reasons, have their firewalls setup to not echo back ICMP packets so they can appear 'invisible' to automated hacker scanning tools. 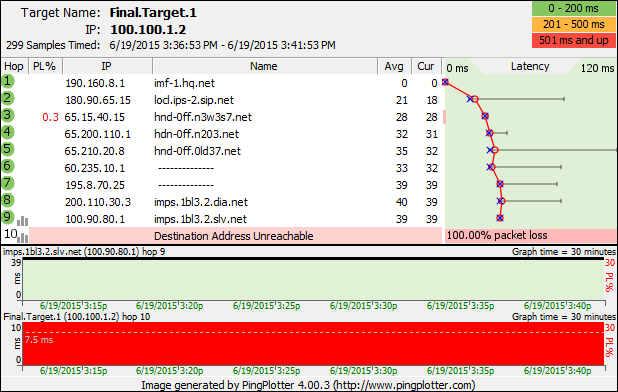 You might try switching PingPlotter to UDP or TCP packets to see if the site works with those (Standard or Pro editions only). This is sometimes a temporary situation (where the site is currently experiencing high ICMP load from a recent attack or similar). If this site is important to you, you might contact the administrator of that site to find out if it's a permanent condition. If none of the hops are responding, then it could be your local machine's firewall that's blocking this. Try disabling your software firewall (make sure you take adequate precautions to protect your machine during this time), and if that helps, then check the settings for your firewall to see if it's set to block ICMP echo requests, ICMP echo replies, or ICMP TTL Expired packets. If the Destination Address Unreachable is happening at hop 1 or 2 (or some other router that seems to be owned by your ISP), then this might indicate that it's your ISP that is causing this (or a local firewall). Once you've eliminated your firewall as a possible problem, try contacting your ISP to see if there's anything you can do to change this behavior.